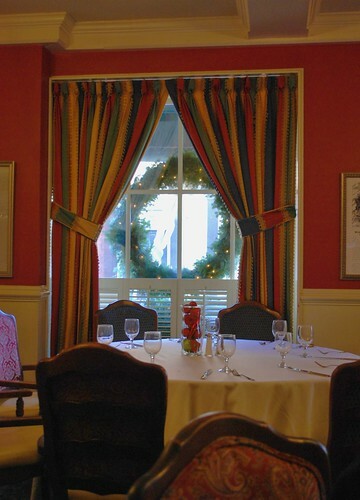 It would seem that nothing builds up an appetite like spending the night in a potentially haunted room as even though I'm not normally much of a breakfast person, I found myself to be quite hungry on the Thursday morning of our stay at Salem's beautiful Hawthorne Hotel. 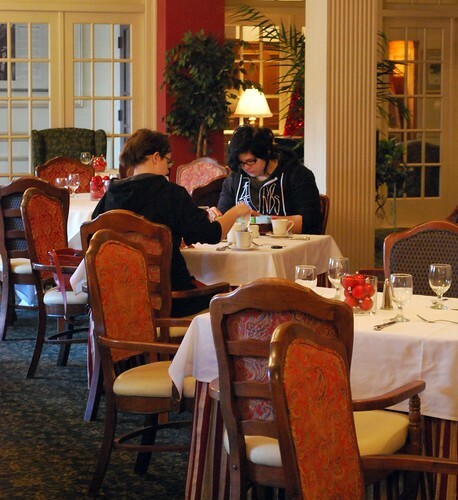 The last time that Jamie and I had stayed at the Hawthorne we treated ourselves to room service but for this trip, I wanted to try breakfast at the award-winning Nathaniel's Restaurant located just off of the lobby sort of kitty-corner to the Tavern on the Green. I'd passed by it many a time and looked longingly in the windows at the beautiful ambiance while promising myself "one of these days" I'd dine there. On Thursday morning, breakfast seemed like the perfect time to fulfill that "one of these days" longing! Before the girls and I left our room to head down to breakfast the room phone rang and on the other end was Juli Lederhaus who is the General Manager of the Hawthorne Hotel and author of the hotel's blog, the Hawthorne Daily Diary. Juli welcomed us to the hotel and asked if we would have the chance to meet while I was there. I told her that I had certainly hoped so as I had really been looking forward to it so we arranged a meeting at 11:30 in between several of her other obligations for the day. 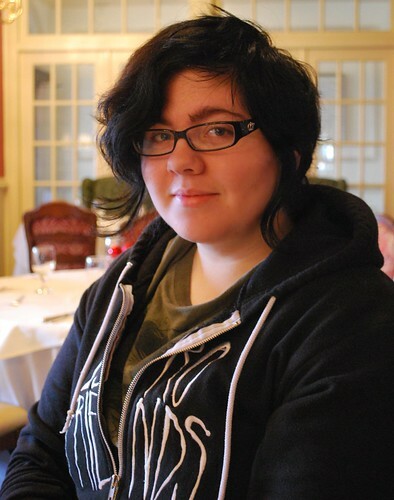 I'd had quite a bit of email correspondence with Juli after our stay in September and I would have been totally disappointed to have not had the chance to meet with her face-to-face. Following our conversation, the girls and I trooped downstairs to Nathaniel's where I was rather delighted to find we had the restaurant to ourselves. The reason for my delight was that it meant that I could wander around and take pictures without disturbing anyone else who might have also decided that it was the perfect place for breakfast! Chances are probably pretty good that most people don't take their cameras to breakfast with them but diligent blogger that I am, I felt it was my duty to take pictures as I'm pretty sure you've come to expect them! I sat down with the girls long enough to place my order before I took a turn around the room which is painted a beautiful rich red. 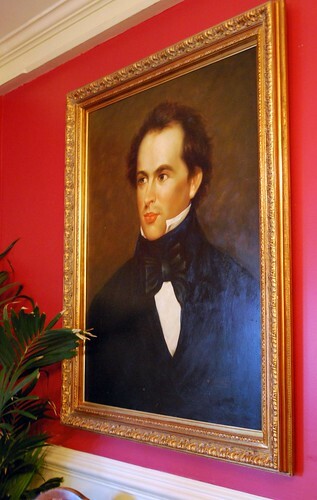 The restaurant, like the hotel, is named after Salem's favorite native son - Nathaniel Hawthorne - so of course his portrait hangs prominently on one of the walls. Some of you may remember when I did a post entitled "Author! Author!" about my short visit to Concord where I visited the graveside of Nathaniel Hawthorne in Sleepy Hollow Cemetery. I learned quite a bit about Mr. Hawthorne at that time including the fact that he really wasn't much of a social being - something that Amos Bronson Alcott, father of Louisa May Alcott, found rather frustrating when the two were neighbors after Hawthorne bought Alcott's former home in Concord. Looking at the picture above I can definitely see where he might be a man who preferred to keep to his own devices rather than playing cards or discussing Transcendentalism with the neighbors! Ah well, to each his own, right? In addition to the portrait of Nathaniel which hangs in his namesake restaurant located within his namesake hotel, if you look out the restaurant windows you can see a statue of the author at an older age than he is in the portrait - though you definitely can't tell that from this distance plus he has his back to us! Probably because of that very thing, on the wall near the window is a framed article with some information on the statue which was brought to Salem in 1925 from Boston where it had stood at the entrance to the former Boston Art Museum for nearly a decade. The move cost the good citizens of Salem $20,000 but they obviously considered it to be money well spent! 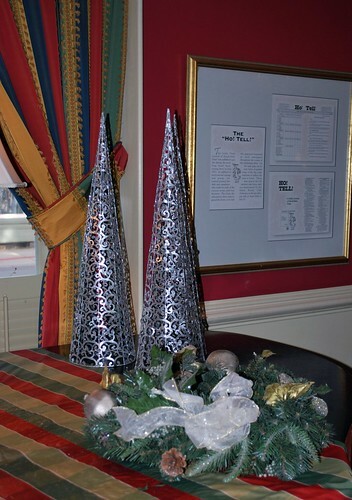 As you can see, the room was very tastefully decorated for the holidays; these silver trees and pretty wreath stood on the baby grand piano that is located in one of the corners of the restaurant. 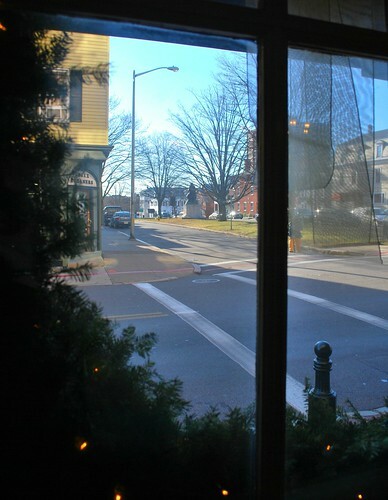 Too bad there's no one to come in and play while you're having breakfast, I bet it would have sounded lovely! Speaking of lovely, doesn't it look the girls are getting along quite nicely from across the room even though they're quite obviously not talking to each other! 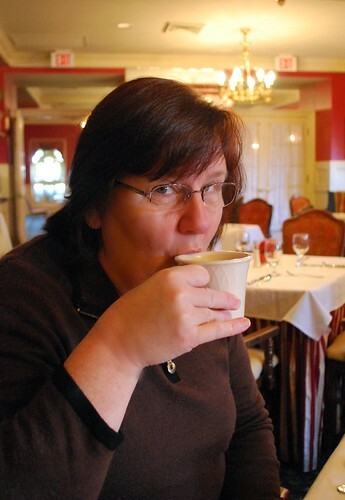 ... and Jamie was enjoying her tea. 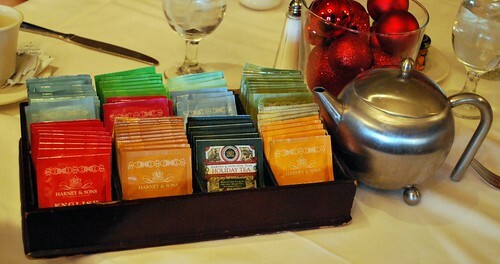 Speaking of which, I just have to show you the tea selection that she had to choose from as well as the lovely teapot that her hot water came in. I bet even my cheeky Brit friend Claire would have approved and perhaps rendered a "Huzzah!" or two! Having taken enough pictures of the room and regaled the girls with stories of Nathaniel Hawthorne that I'm sure they found most interesting (not! 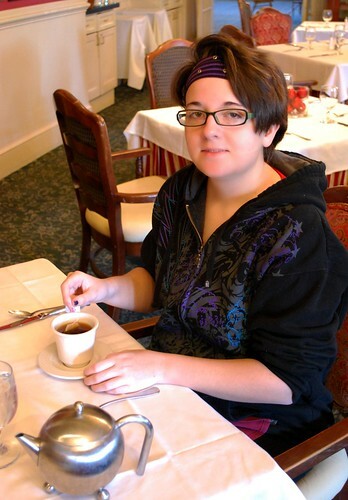 ), I finally sat down and enjoyed some fresh-brewed coffee of my own. Normally I try to avoid posting pictures of myself as I'm really much more comfortable behind the camera than in front of it but the girls insisted so here ya go ... note that I do, in fact, extend my pinky whilst sipping! Rumor has it that indicates good breeding ... or put-on airs ... I forget which! Shortly afterward our breakfast was served but before digging in, I took the obligatory photos. Even though we had all ordered breakfast, there are only two pictures as Amanda and Jamie had ordered the same thing - two eggs over easy with corned beef hash and breakfast potatoes. The only difference was that Jamie had opted for white toast while Amanda ordered sourdough - which she said was absolutely delicious! I went with two eggs scrambled and breakfast sausages with rye toast and am pretty sure I devoured every single bite and left barely a crumb on my plate. I may not be much of a breakfast-eater as a rule but when I do have it, I must say that I enjoy it! After finishing breakfast, we went back up to Room #325 for the last time to gather our things together so that they could be moved to our next room by the hotel staff. When I was told that's how the transfer would be taken care of, I thought that was just the neatest thing ever but it's simply just part and parcel of what makes the Hawthorne such a great hotel! I had anticipated a bit of a wait in between switching from one room to the next but when I turned our keys in to the desk clerk, she said that the room would be ready very soon and took my cell phone number so that she could call me as soon as everything was done. Being that we were going to be meeting Juli soon, I told her that we would probably be staying close to the lobby and probably not wandering off too far but she didn't want to risk us not being within earshot. 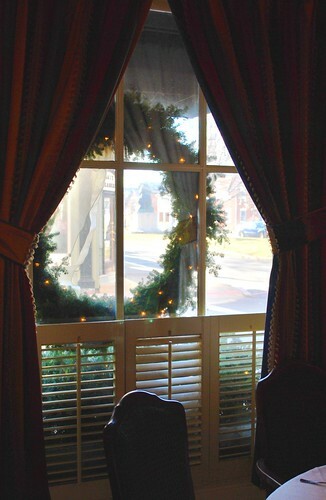 While the girls made themselves comfortable in amongst the comfy furniture and beautiful Christmas poinsettias, I bundled up and went outside into the cold to take pictures of another thing that the Hawthorne does to make its guests feel more than special. 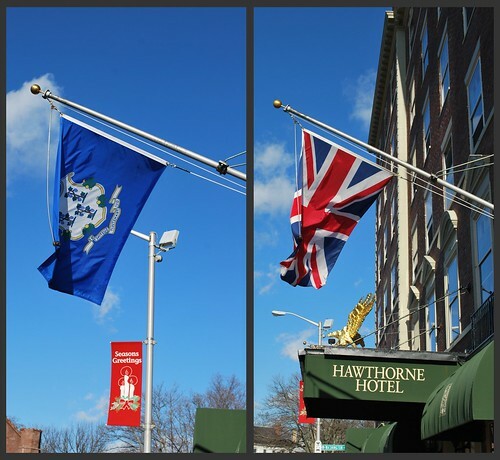 Every day the Hawthorne flies two flags near their main entrance as part of their Flags of the Week program which is done "in the hope that by flying a different country's flag each day, and another state's flag as well, that it will encourage more people to look outside of their own day-to-day lives and find ways to be connected to the rest of the peoples of the world." The flags are flown alphabetically and chosen as one from the countries of the United Nations and one from the States and Territories of the U.S.A. Special requests are also honored so even though the Connecticut state flag had been flown not that long ago on November 27th, guess what was waving beautifully in the breeze on Thursday, December 17th? 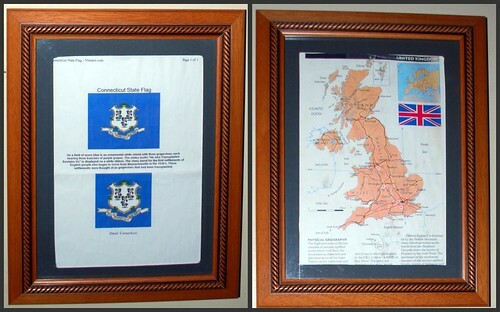 In addition to the flag from my home state was the flag from England to honor my mother's heritage as her mother had come over from England at the young age of nine in the early 1900's while her father's side had been some of the first early English settlers who had made their homes in Connecticut. I gotta tell ya, if you've never had flags flown "in your honor", it sure makes you feel quite special when they are! And look at that blue sky, too! I felt like Salem was quite happy to have us there that day! Before I forget, I also wanted to mention that inside the lobby next to the elevators (and boy do I have stories about the elevators later!) information is posted about the flags that are flying out front. It's just another way that the Hawthorne tries to help us get to know the rest of the world a little better. Pretty neat, huh? Now, I know you're all anxious to find out about Room #612 but I'm going to have to ask you to be a bit more patient as once again I've blathered on and on and need to put an end to this post so that I can try to get a few other things done in anticipation of that big holiday coming up at the end of this week. This is my last day off before Christmas and there is a ton of stuff crying out to be done like gift-wrapping, baking, and more gift-wrapping! Please believe me, I'm not intentionally dragging these posts out just to make you keep coming back, I really want to make sure that I share as much as I can about our wonderful stay just in case you never get the chance to visit the Hawthorne Hotel yourself - which would truly be a darned shame but I know is probably not possible for everyone ... in which case I volunteer to go back in your place - just tell me when! You've got me on pins and needles waiting to hear if you heard/saw anything! Seriously. You seem to have become a Hawthorne celebrity. Imagine, you and Liz the Twoth getting honorary flags when in residence. So tell us about the meeting. What a great adventure and both of those breakfasts looks great. Now I'm hungry. I'll await the next piece of the adventure since I don't have a choice. The Hawthorne portrait looks a little scary! 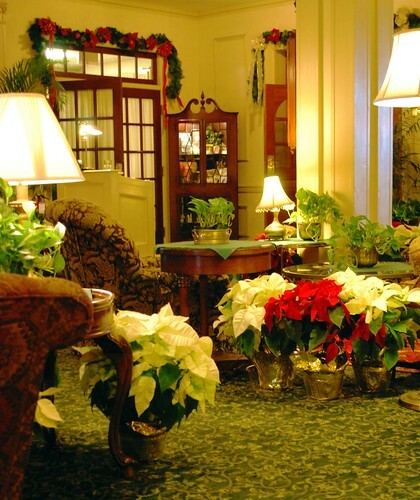 The Hawthorne looks like an absolutely wonderful place to stay! I'd have to have some of that tea, too! The flags was an over-the-top touch. Very nicely done! have a very Merry Christmas dear friend. enjoy your kids! Being the world traveler, I like that idea of the different flags AND the explanation there in the hotel (not just yours!). I am more and more impressed with the Hawthorne on so many levels. I do like your photos. What's not to like? !